This Trevi fountain photo is another of those awesome pictures that makes you realize you have to travel more to see all the beautiful places in the world. If you’ve never been to Rome it has to be near the top of your list. You’ve seen the 85-foot-high and 65-foot-wide Trevi fountain in Roman Holiday (Gregory Peck, Audrey Hepburn, and Eddie Albert) and in Federico Fellini’s La Dolce Vita (the scene where Anita Ekberg gets drenched). If you were less fortunate you might add The Lizzie McGuire Movie (Hillary Duff), Sabrina Goes to Rome (I had to sit through this one), or When in Rome (Mary-Kate and Ashley Olsen). Neptune, god of the sea, is the central figure. He rides a shell-shaped chariot pulled by two hippocamps (sea horses), one calm and one agitated. These horses both symbolize the sea – sometimes calm and sometimes violent. Each sea horse is guided by a Triton. On Neptune’s left is Abundance, on the right Salubrity. The bas-reliefs (carved stone pictures) show the origin of the aqueducts, one of them shows Agrippa, the girl after whom the aqueduct was named. The backdrop for the fountain is Palazzo Poli, a palace. You must be talking about a special fountain when it’s the main attraction and the beautiful palace is just background. Like most other tourists, I turned my back to Fontana di Trevi and tossed a coin over my shoulder. Hopefully it landed in the fountain, but how do you know? Anyway, when you visit you’ll want to go in the morning to beat the crowds and at night to see the lights. 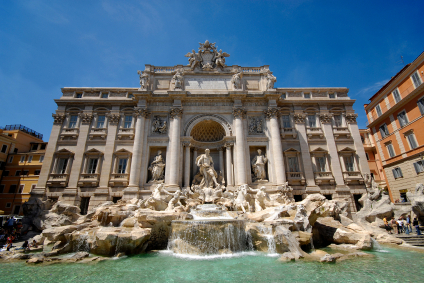 Fontana di Trevi is part of this Rome walking tour. When you need a break I recommend Pizza Re. Can you recommend the best method for looking for travel and lodging to Rome from the USA? My husband and I spent our 20th wedding anniversary in Rome. Our hotel was close to the Trevi fountain. Every evening before we returned to our hotel we would sit at the fountain and eat an ice cream cone from the vast array of flavours available at the nearby ice cream parlour. It was much quieter at the fountain late in the evening. I think that Rome is one of the cities that everyone should try to visit, it is an amazing place.